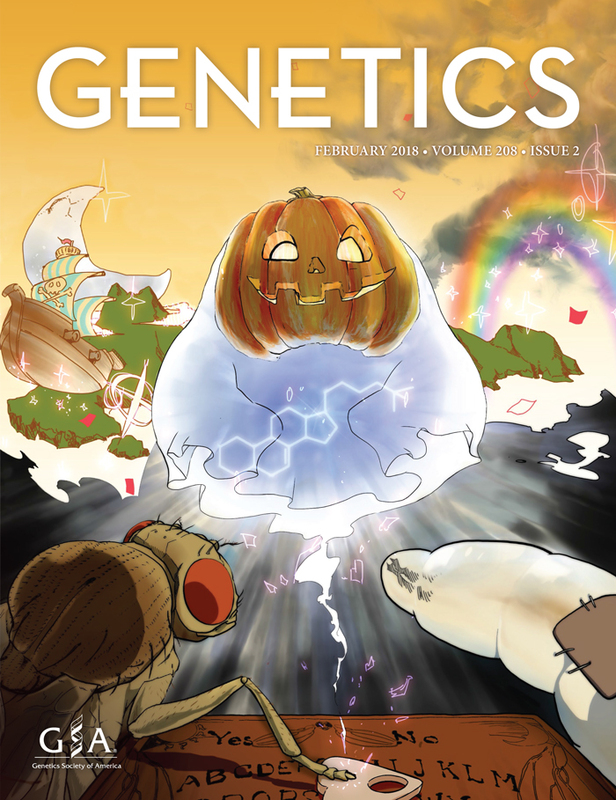 Cover of the February 2018 issue of GENETICS. Artwork courtesy of Ms. Yumiko Matsuura, an undergraduate student at the University of Tsukuba, Japan. In a study published in GENETICS, Uryu et al. investigated how the expression of these genes is regulated. Halloween genes, such as spookier and neverland, are expressed in specific parts of the developing fly at specific times, suggesting that precise transcriptional programming is at play. Since some Halloween genes are regulated by zinc finger transcription factors like Ouija board and Molting defective, the authors explored whether other, structurally similar transcription factors in the Drosophila genome could also play a role. Uryu et al. identified the novel transcription factor Séance as a regulator of Halloween genes. They found that Seance, Ouija board, and Molting defective collectively control the expression of spookier and neverland, which in turn regulate ecdysteroid synthesis. The cooperation of three transcription factors to modulate expression of just two genes underscores the critical importance of spatiotemporal regulation of gene expression. As developmental genes are characterized and studied, our understanding of them continues to increase, hopefully making these sinister-sounding genes a little less scary. However, one burning question still looms: why do Drosophila genes get all the cool names? Outa Uryu, Qiuxiang Ou, Tatsuya Komura-Kawa, Takumi Kamiyama, Masatoshi Iga, Monika Syrzycka, Keiko Hirota, Hiroshi Kataoka, Barry M. Honda, Kirst King-Jones and Ryusuke Niwa.